retail space | retail must burn! Salzburg Sportalm Kitzbühel is one of Austria’s best-known winter clothing manufacturers. When looking to develop a new corporate design for all future Sportalm retail outlets the client wanted to keep the interiors very sober and ‘reduced’, with an emphasis on black and white, since the clothes are colourful and cover a range of different textures. For the firm’s new image, the architects Baar Baarenfels came up with an abstract impression of snow formations. The walls – homogeneously clad with white Avonite – seem to be all of one piece thanks to the undulating forms and seamless finishing. “Cuts” in the surface are reminiscent of breaks in snow covers. The environments are fully distinguishable and the shop fit successfully creates emotional connection with winter landscapes and the lifestyle that goes with it, pointing to the brand’s core product line of winter sportswear. 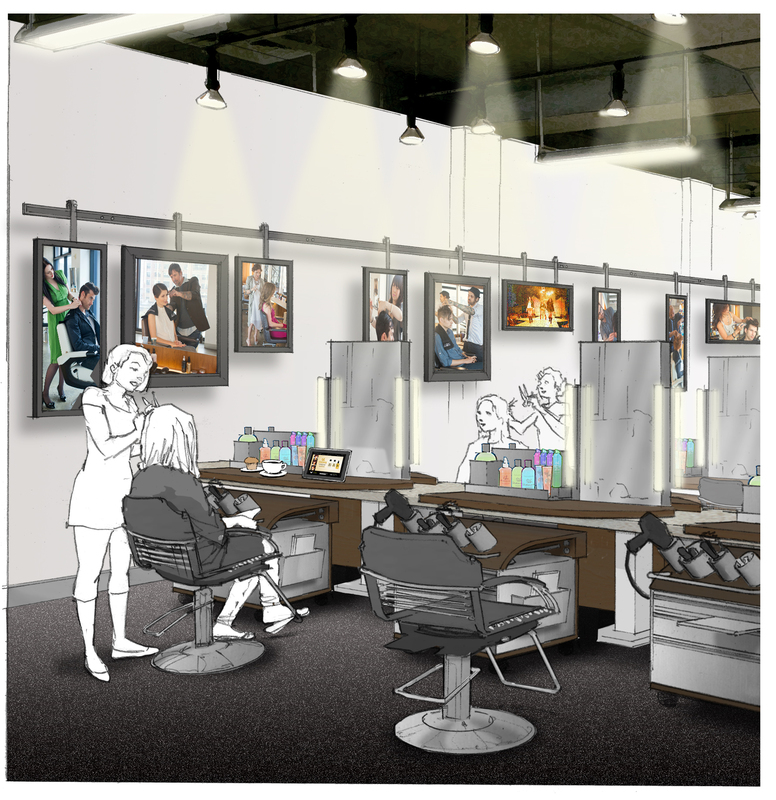 When iconic hair company Bumble and bumble came to us with the request to re-imagine their founding flagship salon in New York their focus was on including a strong retail element into their offering. 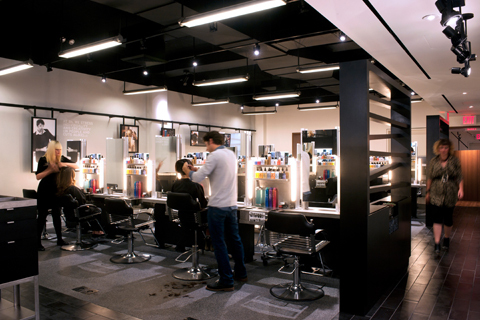 It was clear that the retail space had to be at the front of the store so it could be seen and accessed directly from the street independently of the salon hours. 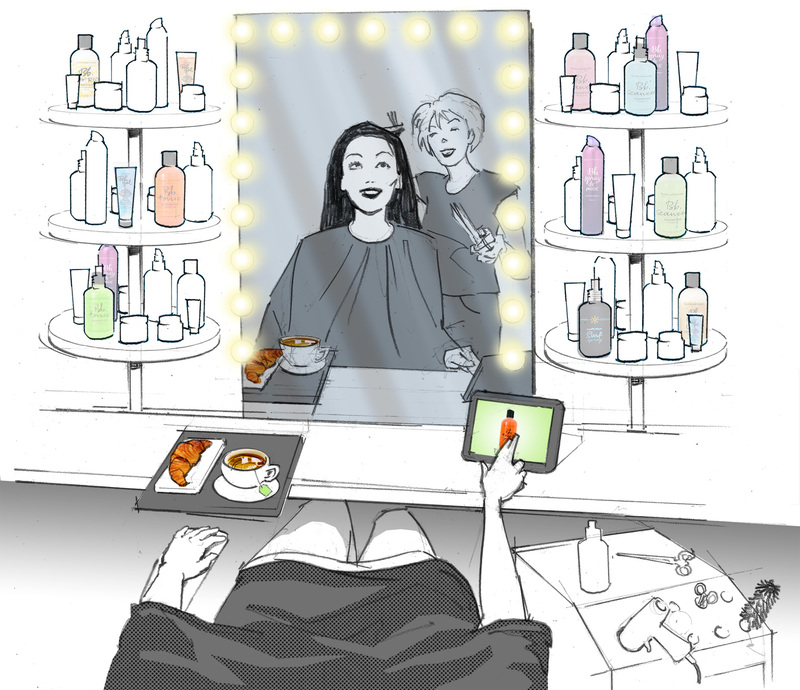 What makes Bumble and bumble so exciting is their artistry and creativity. So we were looking for a way to let this energy transcend into the retail space and at the same time not hide the salon behind retail and away from the street view. The answer was to separate the two entities by a semi open retail partition that would function simultaneously as a product display wall. See-through and “woven” together by an abstraction of hair texture, which then became the theme throughout the salon design, these retail walls define the new retail area at the entry of the salon and are now iconic elements of the Bumble design language. In my previous post “Leading the way!” I wrote about how strategic “attractors” can help pull the customers through space by providing a sequence of stimuli throughout the experience. 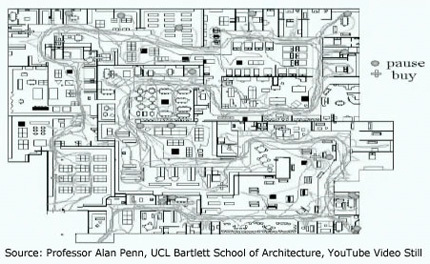 Today I want to look at how care needs to be given equally to the layout of the path. 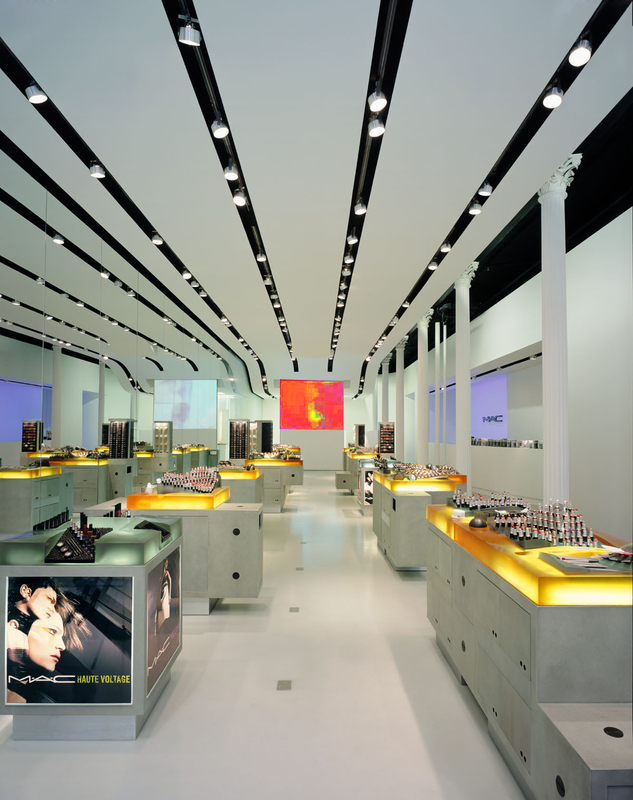 We believe that a store layout is more favorable when it allows for a customer journey without repetition. Creating a round trip experience will keep the attraction and interest levels up. As they move through a choreographed sequence of experiences they will not realize their way through the store, unless the way is experienced backwards, even for some parts. The repeated path is usually without value for the retailer as the customer will have the impression “to already have seen it” and likely expedite their way through that area without any interest or interaction with a product. A good example to this theory are IKEA stores. They have driven this idea to a point where it is impossible to turn back without loosing orientation. So customers are almost forced to complete the journey if they want to ever see daylight again. The negative aspect of taking it this far is that not every customer possesses the same attention span and not being able to exit when you want can create adverse impressions and annoyance. IKEA may get some impulse sales out of a disoriented customer but the experience won’t have a positive perception. (see related article in “Daily Telegraph”) The journey should be offered, not forced. Below is the layout plan of our store example from the previous blog – a jewelry store omni//form designed for the French brand Mauboussin in Singapore. We have mapped possible journeys from the main entrance as well as the secondary but equally important VIP drive way. Even though the store is relatively small, it is organized to allow for a customer round trip with attractors setup along the entire journey. Not every space configuration will necessarily allow for a comfortable round trip journey. Small retail stores very often are narrow and long. 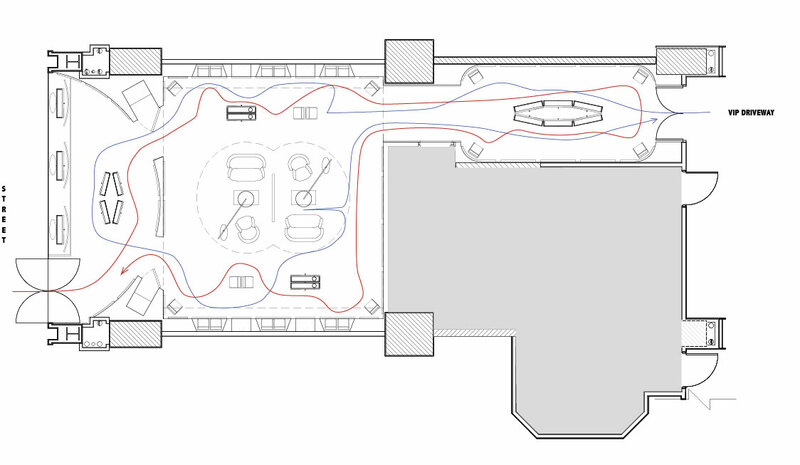 The trick is to get the customer to explore the entire space offering by setting up an attractor or a functional area at the very end of the space. 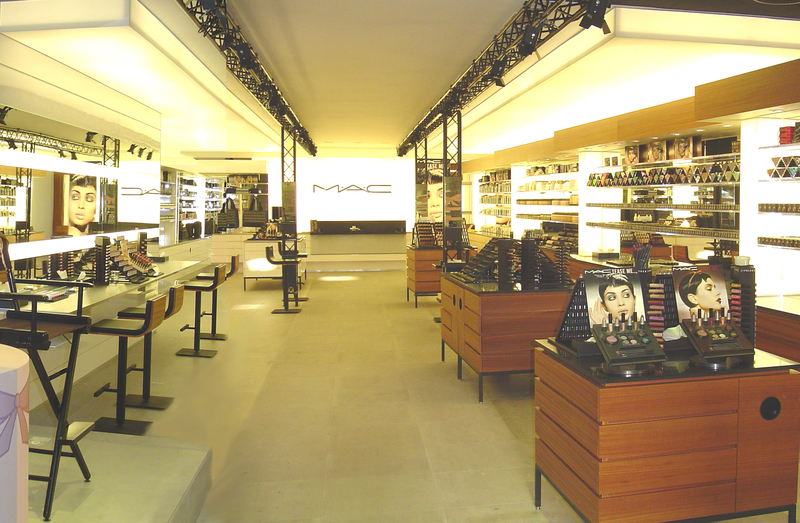 When we designed retail stores for MAC Cosmetics with such conditions, we usually set up an attractor at the deep end of space . This could be a stimulating light element, such as a large light box visual or video screen since humans tend to walk towards light in darker environments. Alternatively we would locate the cash register all the way in the back, so that we could be sure that the customer see the entire store offering before check-out. A round trip journey can also be created by simply introducing island displays, if the space allows. This one comes with the intent of a little self promotion. 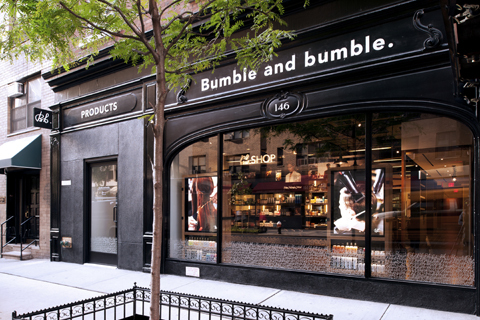 We just completed the renovation of Bumble and bumble’s founding salon in New York City on 146 E 56th Street. The Salon had undergone many iterations of fix ups during the past 20 years with the result that not only it looked outdated but the look did not hold together any more. Neither did the experience. 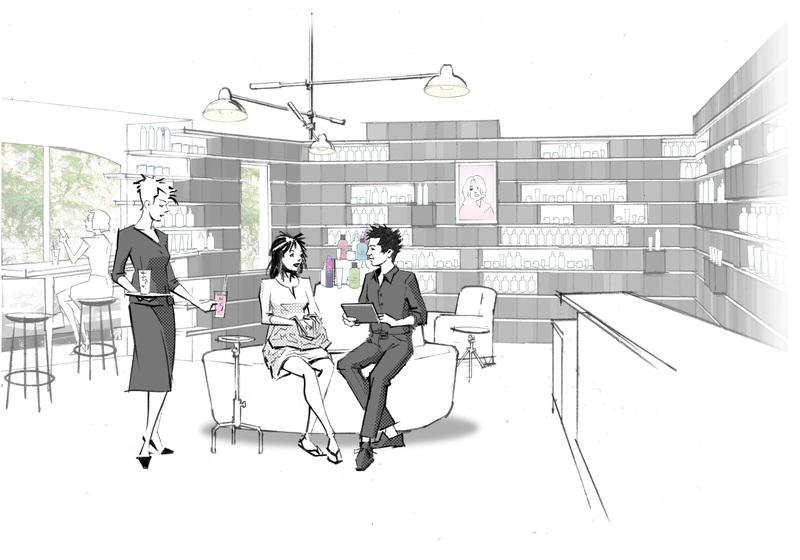 So we first re-imagined the ideal customer experience together with the Salon team and then built the design out from key moments in it. The outcome is a look that builds on brand heritage in a contemporary way and a carefully choreographed experience with refreshingly surprising elements along the way. Check it out if you are in the neighborhood. Open every day except Mondays. I often get asked how we develop retail design concepts for brands that need to retain their identity in multiple formats and locations. “What is your approach and process?” I’m asked. The first part in the design process is finding the brand’s genetic code – the identity – so that we can build the design around it. 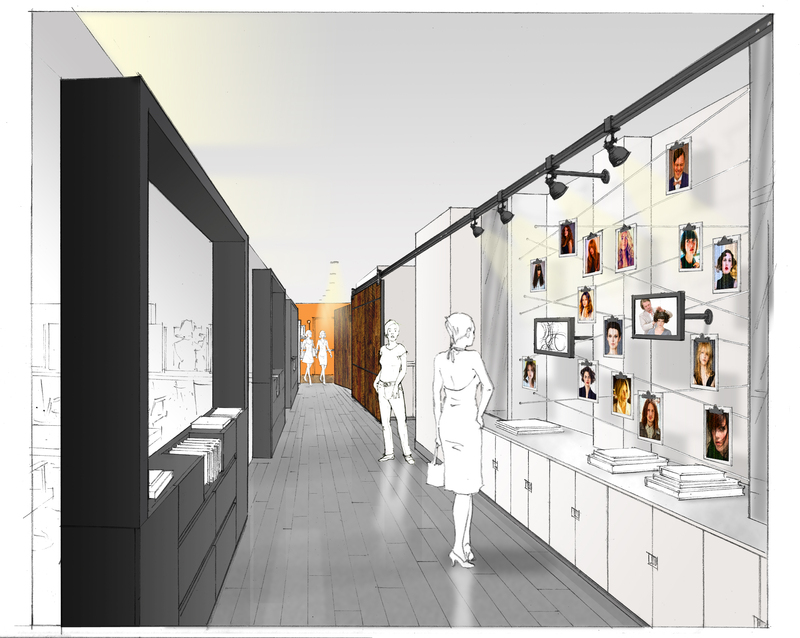 Our task is to develop a “face” for a brand in the beauty and luxury industry. 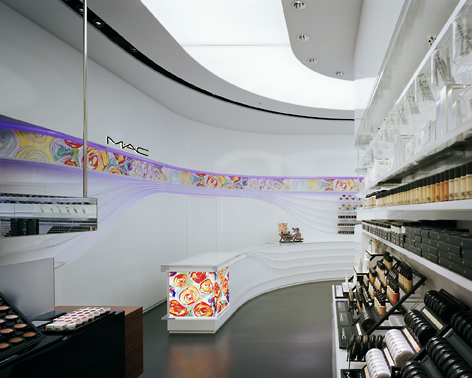 We then use the “face” of the brand to develop concepts for environments – concepts that can be translated into multiple retail formats, from small department store kiosks to full size retail stores. 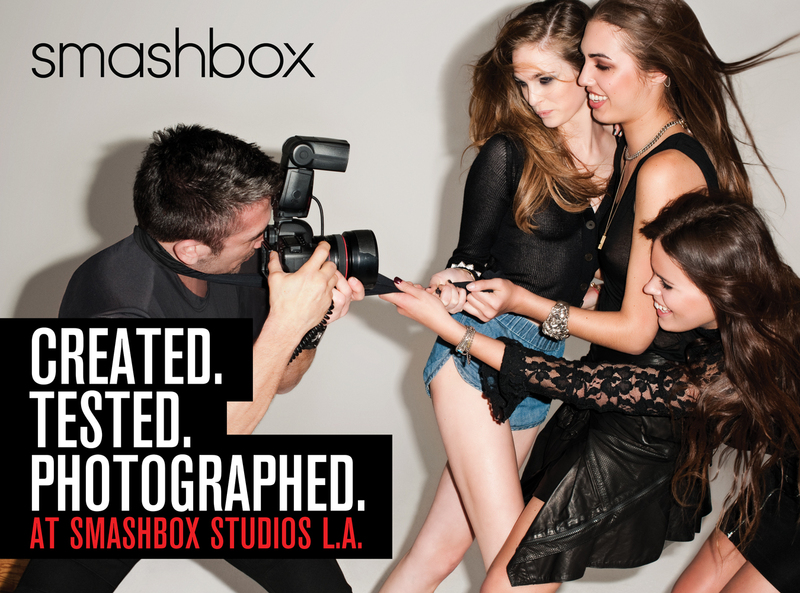 Example: smashbox cosmetics was born in a photostudio. 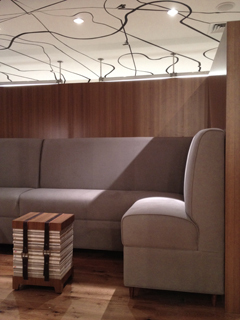 The esthetic of a studio set is the driving DNA behind the brand. A brand’s DNA, the genetic code that created the brand, is what defines it and sets it apart. Often, this code has been altered or watered down over years of brand development. This comes naturally with management changes, brand extensions, and global expansion. If you dig hard you can usually trace the origins of the brand, which are the key elements that made it unique in its origin and eventually made it successful. To create an effective physical design to represent a brand, which can live independently of size and location, it must be close to that original DNA. Think of it this way: the DNA code is in the brand, and the body is the physical retail space created by the brand’s code. The code is the smallest common building block that is embedded into any design expression. It becomes the common thread in all the design formulations to come. The power of a brand is in its core message and we use it as the driving idea behind any aspect of the branded design.